A catastrophic opening, a modest recovery, but in the end a disappointing day. 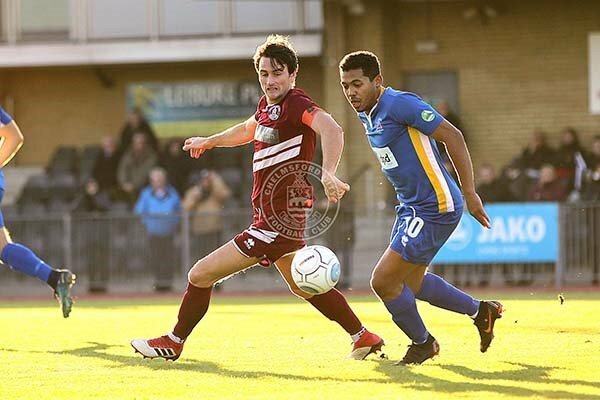 Last Saturday’s trip to Chelmsford brought no reward for Eastbourne Borough in a 3-2 National South defeat. The Sports had arrived at City’s Melbourne Stadium as the only team in the league with an unbeaten away record, but a neutral would never have believed it, as they conceded three goals in little over half an hour to a heavy-artillery home side. A Borough goal just before the break, and a purposeful second half, brought respectability but no reward, and Ryan Hall’s 87th minute strike came too late to make a difference. Manager Jamie Howell was in no mood for excuses. A gruelling journey to Essex, including an eighty-minute motorway crawl to the Dartford Tunnel, was poor preparation, and within three minutes Borough were behind. Chez Isaac picked a pocket down the right of the visitors’ defence and squared the ball to give Scott Fenwick an easy finish from close range. City hot-shot Rhys Murphy almost doubled the lead with a shot into the side netting, but Borough were still insecure, and in particular struggling with City’s set-pieces and long throws. Mark Smith did well to keep out a low Fenwick drive, but just as the Sports seemed to be gaining a better foothold, they conceded again on 27 minutes. This time, there was a touch of controversy or at least of poor sportsmanship. As Harry Ransom, in space in the penalty area, shaped to clear, he appeared to be thrown by a shout of “Man on!” from a Clarets supporter behind the goal, and sliced the ball out of play for a corner. The flag kick, only partly cleared, fell kindly for Anthony Church, whose hopeful swing curled over the scrum of players and sneaked into the top corner. Either an inspired finish, or a bit of a fluke. Eastbourne rallied, and Ryan Hall’s strong determined run created for himself a tight-angled chance, athletically saved by MacDonald in the home goal. But hopes of recovery were dashed by another piece of defensive chaos, as a punted high ball came in from the Chelmsford right. Smith started to come for the punch, thought better of it, and was helpless as Fenwick got in a glancing header past Ransom and Gardner for 3-0. This was foreign territory in every sense. Never before this season had Borough been three goals down, and briefly they looked likely to concede five or six. But only briefly: for the older heads in the team kept their heads, and slowly they wrested back control. Hall played in the lively Charlie Walker who, with the goal in his sights, was hauled back by Kiran Khinda-John – the second time, by the way, that the former Priory Lane favourite has faced his old club, arriving at Chelmsford via Woking. The penalty was nailed-on, and Dean Cox despatched it confidently, with KKJ surprisingly escaping a yellow card. But 3-1 at least gave a glimmer of hope. There was a kind of reprieve a couple of minutes later, when at the other end Kiran crumpled under challenge from Ransom, and almost everyone in the ground believed it was a penalty. Almost everyone. Referee Phil Staynings, perhaps with guidance from his assistant, judged the offence to be outside the box and awarded a free-kick. Cue fury from the locals, and embarrassed glances between Borough supporters. But - with access later to the match video - this reporter can confirm that justice was done: both players were in the D, and not in the area, as they rose for the challenge. And from the free-kick, Smith flung himself full-length for a very decent save. Eastbourne had struggled in the first half against both the wind and the very low bright sun, and at least they now faced only the Clarets and not the elements too. But if Borough had hope, City had breathing space, and only had to defend. A quick goal for 3-2 would very possibly have prompted a full-scale recovery, but although Borough were now controlling the play, their clear sights of goal were scarce. Lloyd Dawes hit one high and wide from another Hall feed, and then a superb power-throw from Smith found Kane Wills on the break, and the midfielder found Hall for a strike which MacDonald did well to hold. Then Ransom’s astute ball forward found Wills, who could not quite control it with just the keeper to beat. And Tobi Adebayo-Rowling blasted off-target on a storming run forward. City were teetering, but not quite toppling. Finally, Ryan Hall drilled a shot across the keeper and into the bottom right corner. 3-2, and with stoppage time there were some eight minutes to play. It was frantic stuff: Smith foraged forward for a couple of set-pieces, but for all the frenetic goalmouth action, the home goal itself somehow stayed intact. A creditable final dash of spirit, but a dispiriting afternoon. Borough: Smith; Adebayo-Rowling, Gardner, Ransom, Campbell; Cox, Wills, Torres, Hall; Walker, Dawes (Odubade 57). Unused subs: Briggs, West, Blackmore, Pollard.